Present state: The station and adjacent depot were demolished in c.2000 to make way for a new housing development (East India Way). A high retaining wall on the east side of East India Way is is of railway origin. Some sections of wall from the station building have been retained as a boundary wall at the entrance to the estate. Notes: The station has been known by a number of different names first appearing in the Railway Clearing House Station handbook as Addiscombe Road Croydon then Croydon Addiscombe Road until 1.4.1925 when it was renamed Croydon (Addiscombe). A year later it was renamed Addiscombe (Croydon) 28.2.1926 with a final name change to Addiscombe on 13.6.1955. As built the station had two platforms, with the platform on the up side (towards London) of the line being an island. The station building was at the southern end of the platform set back a short distance from Addiscombe Road with a short approach road. Following the formation of the South Eastern & Chatham Railway in 1899 Addiscombe Road station was rebuilt. The new station had a large building with a gated forecourt facing on to Addiscombe Road. The main station building contained the booking hall, and led onto a concourse, which in turn provided access to the trains. In 1861 the South Eastern Railway jointly promoted a Bill with the Mid Kent Railway to build a branch line from Beckenham to Croydon with a terminus in Addiscombe Road. This bill received Royal assent on 17th July 1862 and the line was completed in a little less than two years. After passing a Board of Trade inspection the 3 mile branch, with one intermediate station at Elmers End, was opened by the Mid Kent Railway 1st April 1864 with the service provided by the SER. In July 1864 a further Act of Parliament allowed the SER to purchase the MKR outright. A proposed extension to Redhill was opposed by the London Brighton & South Coast and was dropped. The line brought new prosperity to the area with new suburban growth and a second intermediate station was provided at Woodside & South Norwood in July 1871, this station also served the nearby Croydon Racecourse. From 1st April 1880, the SER began operating a service between Addiscombe Road and the Great Eastern terminus at Liverpool Street using the connecting spurs onto the East London Line near New Cross. On 10th August 1885 the Woodside & South Croydon Joint Railway opened a line from a junction 25 chains beyond Woodside Station to a junction with the LB & SCR at Selsdon and on 29th May 1882 a further branch between Elmers End and Hayes was opened. In 1889 the SER merged with the London Chatham & Dover Railway to form the South Eastern & Chatham Railway. Addiscombe Road Station was rebuilt in 1899 but it was nearly a mile from Croydon town centre and was never able to compete favourably with the LBSCR's East Croydon station. In the early 1920's there was a proposal to extend the East London Line from New Cross to Addiscombe Road but differences in current collection was one of several major stumbling blocks and the plans were eventually dropped in 1930. Addiscombe Road was renamed Addiscombe on 1st April 1925 and the line was electrified the following year with trains into central London every 30 minutes. 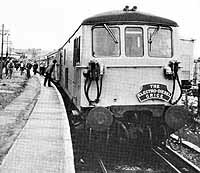 To service the new electric units, a four road depot was erected on the east side of the line at Addiscombe. The Woodside & South Croydon line was never popular and lost its regular passenger services at the beginning of 1917. In 1934 however, the Southern Railway announced that the line would be electrified and re-opened on 30th September 1935. WW2 brought drastic reductions in the service to Addiscombe from which the branch never really recovered. From 16th October 1939 Addiscombe was served by a shuttle to and from Elmers End. Through weekday trains to London were reinstated in the spring of 1948 but traffic on the branch was in decline and these services were withdrawn again in 1950. As the years progressed even the pear hour trains were poorly used. 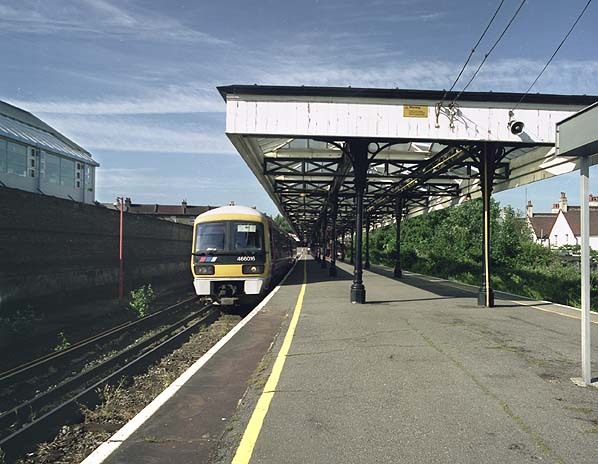 The Woodside & South Croydon Line was closed in 1983, the Addiscombe branch remained open but there was little demand with some off peak trains running empty. By 1993, Woodside station had become unstaffed and Addiscombe booking office was only open during the morning peak hours. Following the announcement that the line from Elmers End to Woodside was to be incorporated into the Croydon Tramlink scheme, it was apparent that the terminus at Addiscombe would close. As closure approached Addiscombe was totally unstaffed after a ceiling collapsed, the main entrance through the booking hall closed with passengers using a side door. The last day of service was Saturday 31st May 1997 with a Networker unit shuttling back and forth with hand-written commemorative stickers on its cab windows. The final service train was the 21.40 to Elmers End and the last train was an enthusiasts' special, this train had also travelled over the West Croydon - Wimbledon line which closed on the same day. 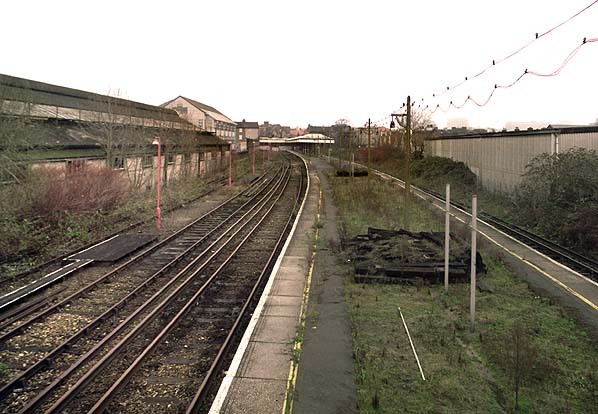 By early 1998 the track between Elmers End and Woodside had been lifted. After closure the South Eastern & Chatham Railway Society announced a proposal to preserve the terminus, together with its adjoining car sheds and establish a working transport museum. Unfortunately both Railtrack and Croydon Council failed to offer any support to the scheme and after a five year campaign to acquire the site the battle was lost. 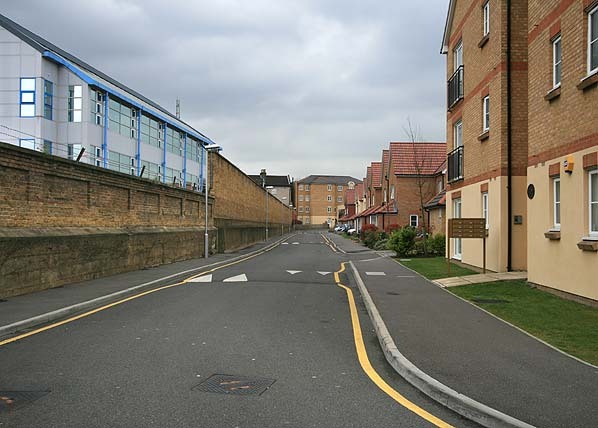 In 2000 Bellway Homes bought the station site with outline planning permission for a housing estate with 65 homes; demolition of Addiscombe Station started late in 2001. Addiscombe Station in the early 1950's. 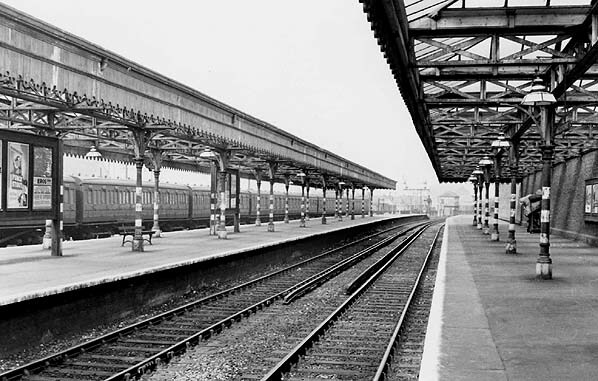 Platform 3 on the right was demolished in 1956 to provide an additional siding. The site of Addiscombe Station looking south in March 2007. Compare this to the picture above taken on the last day. The same retaining wall can be seen in both pictures. The building on the left is also visible in both pictures above.